Greg Alan was the original founder of 4for4 Fantasy Football. To get the 4for4.com site off the ground, Greg assembled one of the best teams of NFL insiders on the web and designed a number of decision support tools and models. In the process, Greg has done guest appearances on sports radio and authored many football articles in various national publications. Greg came from a distinguished 17-year career in industry, pioneering a number of analysis and statistical measurement methods now used by several global Fortune-100 companies. Josh Moore joined 4for4 in 2005 and took over all day-to-day responsibilities in 2009. Josh comes from a background in web development and database design, bringing modern-day technology and vision to the statistically sound foundation laid by founder Greg Alan. Josh was recognized as one of the industry's top-5 most accurate experts in both 2010 and 2011 before handing the site rankings over to the slightly-more-accurate John Paulsen in 2012. 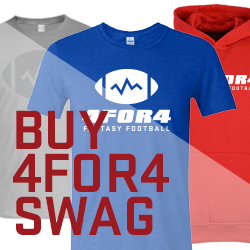 4for4.com Fantasy Football is an online, premium subscription service that gives our subscribers a competitive advantage and increases their enjoyment and success in the fantasy football hobby. As a leading web-based fantasy football research, analysis and information site, we provide accurate rankings, insightful analysis and state of the art decision support tools for the singular purpose of enabling our subscribers to improve in their fantasy football endeavors. We use innovation, customer feedback, networking and mathematical science to continually drive meaningful improvement. 4for4.com is run by Intense Industries LLC, a privately owned, American company. With contacts across the USA, Intense Industries LLC helps drive 4for4.com with insights, information and proven statistical methods. As a fantasy football business, revenue is justified, but only by providing value and benefits to our members and visitors. Our ability to deliver superior products and services depends on maintaining a financial position that invites growth and investment. We appreciate your interest and support. We hope you enjoy and benefit from 4for4.com.